T2K neutrino experiment – Super Kamiokande! Ben Still, who works on the T2K neutrino experiment in Japan, describes the new result they have reported today at the European Physical Society meeting in Stockholm..
For the first time ever the ghosts of the particle world, neutrinos, have been explicitly seen to actively change personality. Results presented today by the Tokai to Kamioka (T2K) experiment fills in previously unseen parts of the picture of how our universe works at the smallest scales, but it also raises some interesting questions. Neutrino particles are ghostly, difficult to see, particles that have real personality issues. They come in three types, known as flavours: electron (νe), muon (νμ) and tau (ντ) neutrinos. The first neutrino experiments used naturally occurring sources of the particles, such as the Sun (electron neutrinos) and cosmic ray particle showers (muon neutrinos), to understand more about how they interacted with the world around them. They seemed to be misbehaving according to either experiment or theory as fewer neutrinos were seen than were predicted. For years neutrinos in nature seemed to be disappearing between being created and then detected in many various experiments that looked for them. After almost 30 years of experimentation all was finally resolved. It was proven that naturally occurring neutrinos were not disappearing, but instead were changing into other types of neutrino which could not be seen, due to having too low an energy. Beams have now been engineered to further investigate this bizarre characteristic now known as oscillation. These beams are specifically muon-type neutrinos because physicists copied cosmic ray particle showers in nature. Experiments saw the muon-type neutrinos disappearing as expected from natural observation. Because of the disappearance they were assumed to be changing into tau-type neutrinos, which did not have enough energy to produce a tau particle and be directly seen. For the first time neutrinos have actively been seen to change from one flavour to another rather than just viewing a disappearance. The T2K experiment has seen muon neutrinos change character to become electron neutrinos after a journey of 295km across Japan. The certainty of this measurement is quoted as 7.5 standard deviations from zero or to put in terms of percentage over 99.9999999999936% sure that the appearance is occurring. History has shown us that the more we understand about neutrinos the more secrets of nature they uncover. The observation made by T2K opens up a whole new way of observing neutrinos. As we continue to piece together the character of the neutrinos we hope to continue uncovering more bizarre secrets; they may even be the key to how the raw material for the Universe was first created. More information on the EPS HEP meeting is here, and further details of the presentation can be found here. An important new discovery has been made in Japan about neutrinos. These are the ghostly particles that flood the cosmos but which are extremely hard to detect and study. Experiments have now established that one particular type, known as the muon “flavour”, can flip to the electron type during flight. The observation is noteworthy because it allows for the possibility that neutrinos and their anti-particle versions might behave differently. If that is the case, it could be an explanation for why there is so much more matter than antimatter in the Universe. Theorists say the counterparts would have been created in equal amounts at the Big Bang, and should have annihilated each other unless there was some significant element of asymmetry in play. “The fact that we have matter in the Universe means there have to be laws of physics that aren’t in our Standard Model, and neutrinos are one place they might be,” Prof Dave Wark, of the UK’s Science and Technology Facilities Council (STFC) and Oxford University, told BBC News. The confirmation that muon flavour neutrinos can flip, or oscillate, to the electron variety comes from T2K, an international collaboration involving some 500 scientists. The team works on a huge experimental set-up that is split across two sites separated by almost 300km. At one end is the Japan Proton Accelerator Research Centre (J-Parc) located on the country’s east coast. It generates a beam of muon neutrinos that it fires under the ground towards the Super-Kamiokande facility on the west coast. The Super-K, as it is sometimes called, is a tank of 50,000 tonnes of ultra-pure water surrounded by sensitive optical detectors. These photomultiplier tubes pick up the very rare, very faint flashes of light emitted when passing neutrinos interact with the water. In experiments in early 2011, the team saw an excess of electron neutrinos turning up at Super-K, suggesting the muon types had indeed changed flavour en route. But just as the collaboration was about to verify its findings, the Great Tohoku Earthquake damaged key pieces of equipment and took T2K offline. Months of repairs followed before the project was able then to gather more statistics and show the muon-electron oscillation to be a formal discovery. Details are being reported on Friday at the European Physical Society Conference on High Energy Physics in Stockholm, Sweden. “Up until now the oscillations have always been measured by watching the types disappear and then deducing that they had turned into another type. But in this instance, we observe muon neutrinos disappearing and we observe electron neutrinos arriving – and that’s a first,” said Prof Alfons Weber, another British collaborator on T2K from the STFC and Oxford. 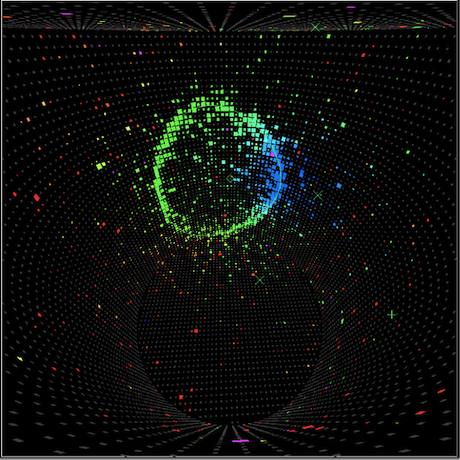 Neutrino oscillations are governed by a matrix of three angles that can be thought of as the three axes of rotation in an aeroplane – roll, pitch and yaw. Other research has already shown two of the matrix angles to have non-zero values. T2K’s work confirms that the third angle – referred to as theta-one-three – also has to have a non-zero value. This is critical because it allows for the oscillations of normal neutrinos and their anti-particles, anti-neutrinos, to be different – that they can have enough degrees of freedom to display an asymmetrical behaviour called charge parity (CP) violation. 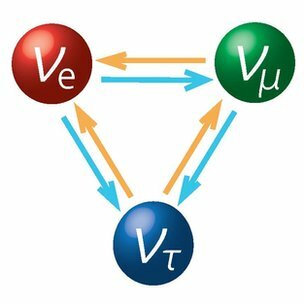 CP-violation has already been observed in quarks, the elementary building blocks of the protons and neutrons that make up atoms, but it is a very small effect – too small to have driven the preference for matter over anti-matter after the Big Bang. However, if neutrinos can also display the asymmetry – and especially if it was evident in the very massive neutrinos thought to have existed in the early Universe – this might help explain the matter-antimatter conundrum. The scientists must now go and look for it. It is likely, though, that much more powerful neutrino laboratories than even T2K will be needed to investigate the issue. “We have the idea for a Hyper-Kamiokande which will require an upgrade of the accelerator complex,” Prof Weber told BBC News.